As I have discussed in parts one and two of this case study, I am researching the house history of one of the buildings we own in Shrewsbury, Missouri. 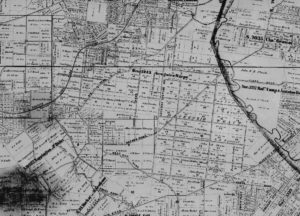 The original land owned by John J. Murdock (Murdoch) was called Murdoch Farm on early maps of St. Louis County. The more that I have learned about Murdock, the more intrigued I have become. He was born in New Jersey in 1814 to James and Maria Murdock. He came to St. Louis in 1838 and became an auctioneer and merchant in the downtown area very near the Mississippi River. At some point he took on a partner named Charles K. Dickson and the firm of Murdock & Co. became Murdock & Dickson, an auction and commission house dealing in dry goods, notions and clothing. The firm was highly successful and expanded into real estate holdings including land, apartment buildings and even an opera house. There is a subdivision in the city named after them. The two men were friends with James B. Eads and had some hand in the Eads Bridge project. In 1855 John Murdock married Julia Hull, the niece of Dickson’s wife. Julia was born in 1835, so she was quite a bit younger than her husband. They had six children, the youngest of whom was born in 1870. An 1857 map of St. Louis county shows the Murdoch Farm land as being owned by Murdock & Dickson, and a directory of St. Louis from that same year indicates that Murdock lives “in country”. What that tells me is that I need to be looking for Murdock & Dickson as purchasers of the land prior to 1857. As I have mentioned before, looking for them as grantees or buyers of land in the index of grantees is a monumental task due to the business they were in. They were buying and selling land all the time, making it difficult to pinpoint a particular land purchase. Additionally they owned other pieces of land in the same vicinity of what would ultimately be the 300 acres known as Murdoch Farm. Old John did not make this easy for me. There are several references stating that Murdock was a General in the Civil War. I do not think that is correct. First of all there is no evidence that he ever served in the military. Officers and particularly generals in the Civil War are very well-documented. After looking at the books of officers, reviewing online sites, and consulting with a Civil War expert at Jefferson Barracks I don’t believe he was in the Civil War, much less an officer. Additionally directories in St. Louis place him here doing business during the war, and his death notice makes note of the fact that before the Emancipation Proclamation was signed in 1868 he took his slaves to downtown St. Louis and set them free. Another error that I have found is that some sources state that Murdock is the one who named his farm Shrewsbury Park after a village in England. Murdock had been dead for nearly a decade before the land was platted as Shrewsbury Park. The development company chose the name for the new subdivision in 1889. Shrewsbury itself became a village in 1913 according to the city’s website.